GOLDEN Key International Honour Society, F.E.E.D (Feed, Educate, Empower and Develop), #BeingAWildFlower women’s campaign and Wits will be hosting the global GirlRising campaign in an attempt to raise funds for girls’ education and fund university bursaries. 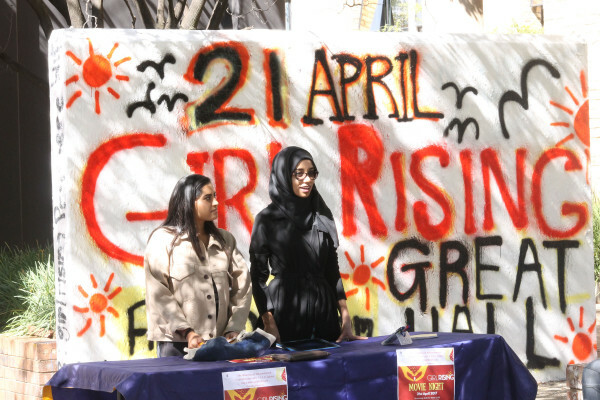 GirlRising is a global campaign that was initiated by the United Nations to educate and empower girls and to raise awareness around financial, political and cultural issues that girls face in the world today. The campaign uses storytelling, in the form of movie screenings, to raise awareness and illustrate that girls who receive an education can change societies and communities. Abuse, oppression, culture and the lack of education are issues that women across the globe face. According to Pardesi, the movement emphasises the need for female education. By targeting the root of the issues, it aims to empower and educate girls as this would allow them to grow up as educated women who will then further educate future female generations. “Educating girls can break the cycles of poverty in just one generation,” said Pardesi. Furthermore, she said females across the globe face challenges that males do not. Early marriage, gender-based violence, domestic slavery and other socioeconomic factors are a few of the challenges that many girls face. By removing these, a better society and world would be created, she said. The campaign not only addresses financial issues regarding female education but more it addresses the social, political and cultural issues that hinder female education. Raising funds for girl education is the best mechanism to dismantle these issues. Witsie Michaela Eitzen said, “As the youngest daughter of two siblings, I find funding to be fairly difficult occasionally. I do have an arrangement with my parents where I pay them back and they pay my tuition.” Eitzen also said that she and her siblings have an arrangement with their parents whereby if either of them fails they would lose the privilege of their parents’ financial aid. The campaign has partnered with F.E.E.D to publicly screen films in South Africa while all the funds will be donated to bursary funds for females.